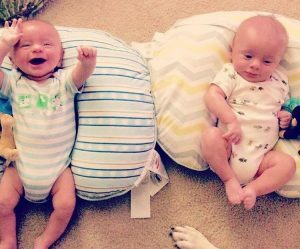 Boppy pillows were the number one answer from twin moms across the board! 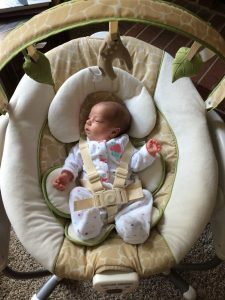 These lounging chairs for newborns are so versatile they can be used for many different things; tummy time, feedings, and just for chillin’ out in the living room. Why they’re great – Our girls LOVED lounging in these while holding their toys and the propped-up position gives them a pleasant view of what’s going on around them. When they were super small they could even fit in the same one, (pictured above) although be sure to keep an eye on them while doing this. 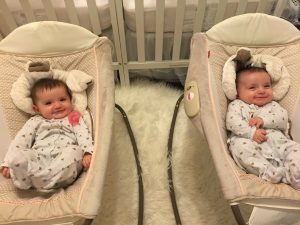 It’s also easy to simultaneously feed twins their bottles while they’re propped up in Boppy loungers which is an amazing time-saver for mom!!! 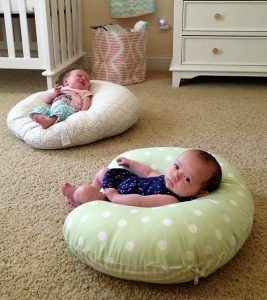 A single Boppy Newborn Lounger runs around $30 at most retailers. There are a TON of cute patterns and colors to choose from! Another great style is the Twin Z Pillow (pictured above). 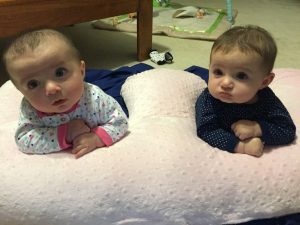 This allows your twins to be nestled side by side and helps support tummy time. They will also really enjoy interacting with each other by being positioned so close. The Twin Z Pillow found HERE runs around $100 and is available in about 5 different colors. 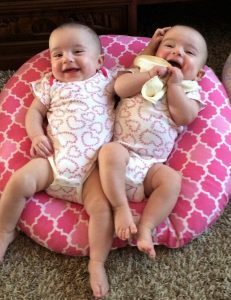 The smiling twins in the picture below are clearly feeling relaxed in their Rock’ N Plays. Why they’re great – So many notable features about these; for starters, they play music and vibrate which is perfect for lulling a baby to sleep. They are relatively small so two will easily fit right by your bedside. 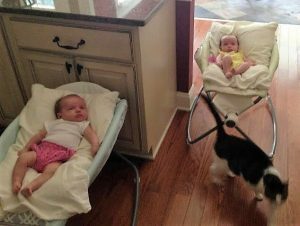 They’re also very light weight and can be effortlessly moved to wherever you need in the house for the day. I’ve also been told that the slight incline in these helps comfort a baby with Colic. Rock ‘N Plays come in a broad range of styles and pricing can be anywhere from $40 – $100. The Fisher Price Sweet Surroundings Monkey Deluxe Auto Rock N Play Sleeper from Target costs around $72 and has high customer ratings & a cute little monkey cushion. You will be bottle poppin’ all night with new born twins and sadly I’m not talking about the fun bubbly! We went through sooo many baby bottles in such a short amount of time, it’s a challenge to stay stocked up with clean bottles ready for the next feeding when you’re constantly providing for two hungry newborns. Why they’re great – I purchased two different types of bottle dryers and we used them both for the entire first year of twinsanity. 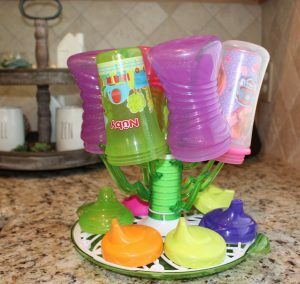 My girls are now 2 ½ years old and I still use the Munchkin Sprout Rack for their sippy cups (pictured above). It definitely serves it’s purpose, frees up counter space and it’s very easy to clean! Bottle dryers come in a wide range of styles and prices. The Boon Grass Counterop Drying Rack costs – $13, Munchkin Sprout Drying Rack – $19 on Amazon. Several people told me about this miraculous baby Keurig of sorts – I have never personally used this, but I can definitely understand the appeal. Why it’s great – The Baby Brezza not only measures and mixes the formula for you it also heats the formula to the proper temperature and pours it straight into the bottle. That’s a lot less steps for Momma to take! If we end up going the formula route for baby number 3 this will definitely be on my wish list! 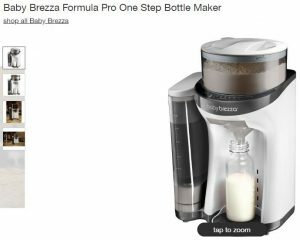 This Baby Brezza Formula Pro is from Target, they can also be found at several other retailers, this particular brand runs right at $180. No one wants to wake a sleeping baby, EVER and click-and-go car seats/strollers are perfect for swiftly transporting the sleeping newborn while causing as little disturbance as possible. 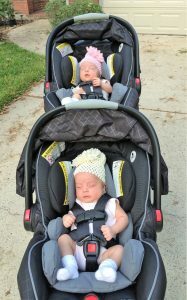 We used infant car seats and boosters by Graco and a City Select stroller. Several other moms I spoke with also went with these two brands. There are several different combinations of click-and-go’s just like this (Buy Buy Baby was super helpful with explaining the different options and helping me find the best one for our needs). We bought car seats similar to these with a single stroller frame and an additional seat to make it a double stroller, I included both links for these below. Side note, just in case you didn’t know –those Bed Bath & Beyond 20% off mailer coupons can also be used at Buy Buy Baby on select items! We cycled through about 6 different swings including a $275 4Moms MamaRoo and surprisingly the lower cost swings were the girl’s favorites! In my opinion you really don’t need all the fancy bells and whistles that come with some of the more expensive swings, just get one that has a few different setting options for speed and motion. Also, a swing that plays soothing music and has a mobile or something for the baby to look at is all they really need! The following two swings have high customer ratings at Target and include mobiles, several different swing movement options and soft music – Graco DuetConnect LX With MultiDirection Baby Swing runs around $120 and Fisher Price Starlight Revolve Swing with Smart Connect costs close to $152. A sound machine is a must!!! 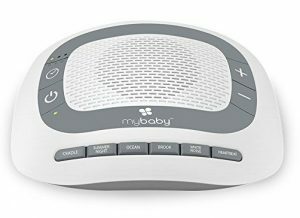 We used one similar to the MyBaby White Noise Machine for Babies. This is also something I wouldn’t bother to splurge on. Some of the pricier options include projections for the wall and I felt like those only kept my babies awake. A simple white noise machine will cost less than $20. There are also lots of apps you can use that offer white noise sounds if you are traveling with the babies and don’t want to pack the machine too. I use the White Noise Deep Sleep Sounds free app. We still keep a small air filter in the twin’s room for white noise and that does the trick too. I’ll never forget the first time I saw one of my best friends using this on her 6-month-old I nearly threw up in my mouth and swore I would NEVER EVER have kids (luckily that didn’t happen). Why it’s great – This thing is gross but highly effective. One of our kids had constant congestion the first two years of her life and this was always our go to. I still make my husband do the bugger sucking and neither of the girls enjoy the experience, but it does its job and fully clears out their little noses. We purchased ours from Amazon – Fridababy NoseFrida The Snot Sucker Nasal Aspirator for around $16. 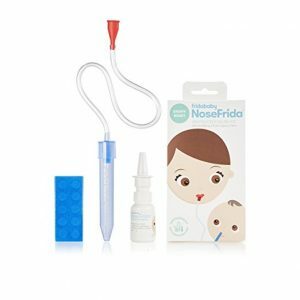 You can also find the NoseFrida with a saline spray that costs just under $20 on Amazon – NoseFrida the Snotsucker Baby Nasal Aspirator and Saline Nasal Spray Kit. I’m not the type of person that needs to have a particular brand of anything but Aden + Anais is now the only type of burp cloth I will buy! Not surprisingly nearly every twin mom I talked to also recommended it to me! 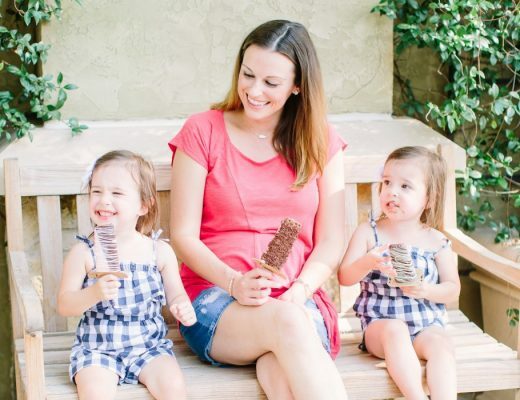 Why they’re great – Aden + Anais not only has super cute designs, but their burp clothes are extremely absorbent and versatile, these can be used as either a burp cloth or a bib – Aden + Anais Burpy Bib, Safari Friends, $10 at Walmart. 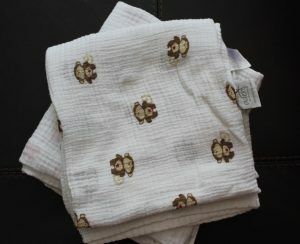 I also love their swaddle blankets (seen below). These are perfect because the fabric is super soft and breathable. They also have about a million cute design options! 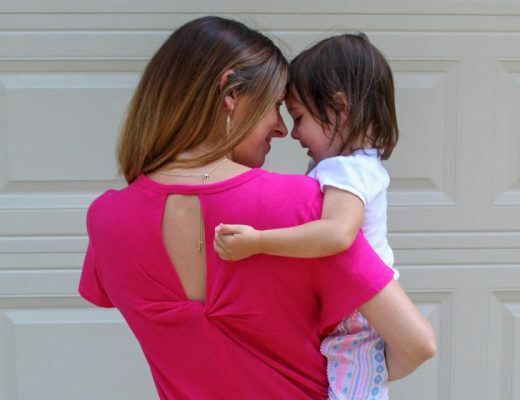 Walmart carries these as well as several other major retailers – Aden + Anais Swaddles, Dreamy $20 at Walmart. 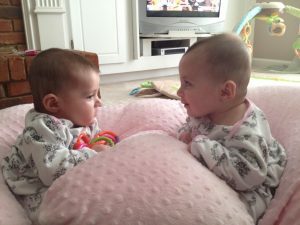 Double baby monitors are a must to keep a constant eye on both of your twins at the same time! We purchased the Summer Infant brand that also offers a talk button that really helps when I’m laying in bed at night and don’t want to walk up the stairs to tell the girls to be quiet. We mounted our cameras on the ceiling to get a bird’s eye view of what those little twinsies are up to and it has worked out great! 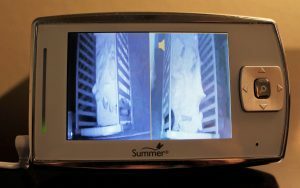 We found the Summer Infant Dual View Digital Color Video Baby Monitor on Amazon for around $262. A warranty is included which did come in handy for us since the one we purchased randomly stopped working one day and Summer Infant sent us a brand new one for free! 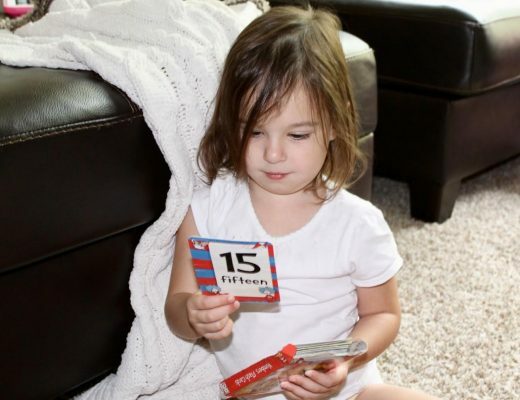 We still use this with our 2 1/2 year old’s and probably will continue until they are at least 18! I hope this list of necessities helps ease your early days of twinsanity!!! Please leave questions or comments in the comment field below. Also, please share if you have a baby product that really helped you during the newborn phase and we will add it to this list! ***Please note that all information in this blog is based on my own personal opinions and experiences as well as the individuals who were polled for this article. I am not paid by any of the above retailers to share my experiences about these products. These products are great and I can’t wait to follow along on your blog! The twin Z pillow was a life save for us! We used it for bottle feedings too! We also use the summer infant monitor and enjoyed it. Ironically, 18 is also my target age to discontinue use of a baby monitor 😀 great read! That’s a really cool monitor! I just have one baby and we’re nearly at 3 months…someone gave us a very old swing…but man, that thing is magic! 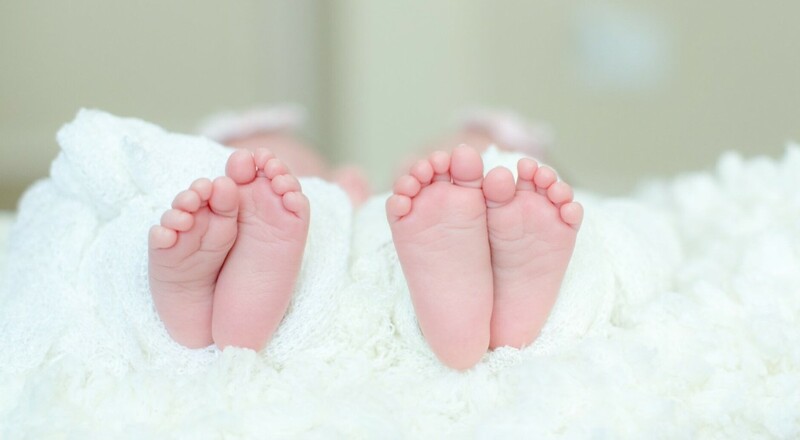 Great tips for new twin moms. The twin side by side monitor is a must! Yes, please send to her! Twin momma’s need all the help we can get 🙂 I agree, Boppies are the best! These are great! 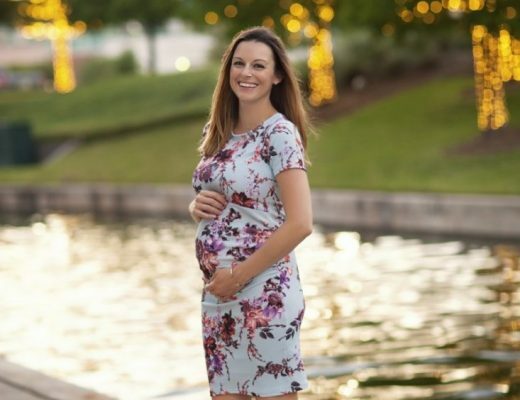 I have a little one due in August and I can definitely use some of these suggestions! Congratulations, momma! I hope these products help with you new LO! My sister in law used her swing chair all the time and swore by it! It made me wish I had had one when my boys were little. Seriously! 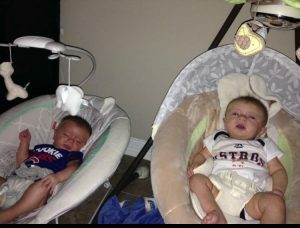 The swing chair is a miracle worker!! !